Three of our current seniors took on summer internships in relatively different fields and in very different locations. Cassandra Fernandes, a political science and business major from San Diego who radiates creativity and with a genuine curiosity for international relations, surprised me when she told me her internship was at Google headquarters in Mountain View, California. It was her interest in international business that made her aware of the immense influence that a big tech company can have on power throughout the world. Cassandra’s incredible motivation to enter the tech world, along with valuable advice and help preparing for interviews from theta sisters who had worked at similar companies like Facebook, guided Cassandra through a quick and successful application process. During her internship, she got the chance to work in the research and machine intelligence group alongside big-name Google mentors, whom she fostered great relationships with while doing fun things like bowling inside the headquarters. She was pleasantly surprised by the level at which she got to interact with higher-ranking members of the company and really advocates for keeping communication open with mentors and meeting as many people as possible. Not only was I amazed by the things Cassandra accomplished and learned this past summer, but also by her desire to have more women apply to internships in tech industries—even if they do not meet all the requirements or are not a tech major—because “there are roles for you in these places!” As Cassandra put it, “the benefits are incredible,” and she welcomes anyone who is interested in finding similar opportunities to reach out to her. Another senior who really embraced her internship and maximized her location was Lynley Matthews, a biology major from Memphis, Tennessee. This summer she conducted research in Zweibrücken, Germany at an English-speaking lab funded by the German government. Lynley ingeniously used her interest in research to not only find a phenomenal internship, but also to travel the world in place of study abroad. Her research lasted 10 weeks and during that time Lyney developed incredible relationships with her coworkers, got to use the weekends to explore much of western Germany and other areas via train, and enjoyed much of the culture around her, especially the food. She described it as a “learning experience” in a variety of ways, from the cool intel she gained in the lab, to the beautiful sights she saw while wandering through Europe. Lynley even embarked on a solo journey for two weeks after her internship was over, where she put a great amount of theta recommendations and global knowledge to good use. She definitely encourages finding work opportunities in urban settings, especially if abroad so the learning curve is better, but living in a small town was an overall remarkable experience for Lynley. 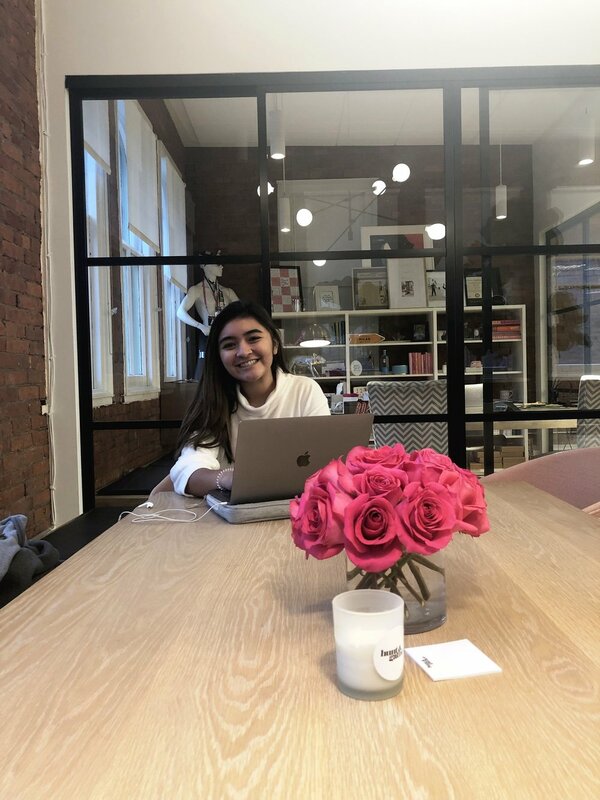 Finally, a sister who is currently interning at Hunt and Gather, an innovative and fun marketing and communications agency in NYC is Nicole Rodriguez. Nicole is a sophomore from New York with a growing interest in business and English. This internship has been a perfect outlet for Nicole’s creative side and an exciting way of gaining exposure in a field she may potentially pursue. Although the agency works with some pretty big-name brands and companies, the office has maintained a relatively small size so that everyone’s ideas and input actually make an impact to the overall work being done. The same research and work that Nicole is doing as an intern is what higher-level coworkers are also taking on and that creates an inspiring feeling of importance and collaboration in the office. Being in a space where her creativity is valued and she can add on to campaigns has made Nicole aware of a potential future career, and she loves being able to bring in insight and suggestions from the girls around her, such as fellow sisters. It is eye-opening and encouraging to see how all these internships have created working spaces for sisters to thrive and explore their interests and talents!